My family has a few long road trips planned this summer and let’s face it… the kids get bored! Although we allow the luxury of some electronics during long car rides, I also try to come prepared with a few fun learning activities to keep them entertained. 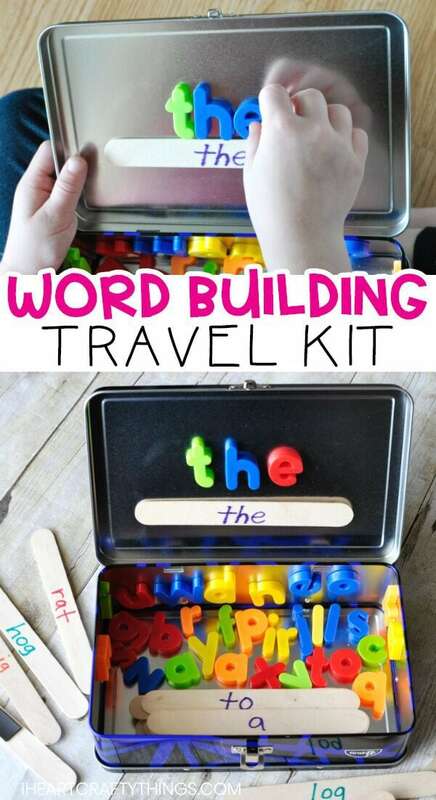 This Word Building Activity Travel Kit is one of my favorite ways to incorporate learning into travel with young children. The best part is you can customize it with sight words, color words, word families, or whatever your child is currently learning! Magnetic tape *We received ours from our friends at Craftprojectideas.com. All opinions are my own. You can find some at your local Walmart in the craft aisle. 1. Start by gathering all of your supplies. We found our metal pencil box at Walmart. I’ve included a link above where you can buy them on Amazon, but a metal lunch box will work as well. 2. Use permanent markers to write words on the jumbo craft sticks. I made a few different sets of words for this word building activity. I started with basic sight words and CVC words, as well as word families for -at, -ig and og, but you can literally customize it however you like… number words, animals, days of the week, etc. This is a great way for early readers to build vocabulary and improve spelling. 3. Use a hot glue gun to attach a small piece of magnetic tape to the back of each stick. Even though the magnetic tape has adhesion on the back, I recommend using a hot glue gun as an extra precaution. Magnets are extremely dangerous for children if swallowed, so using the hot glue will help reduce the risk of them falling off. 4. 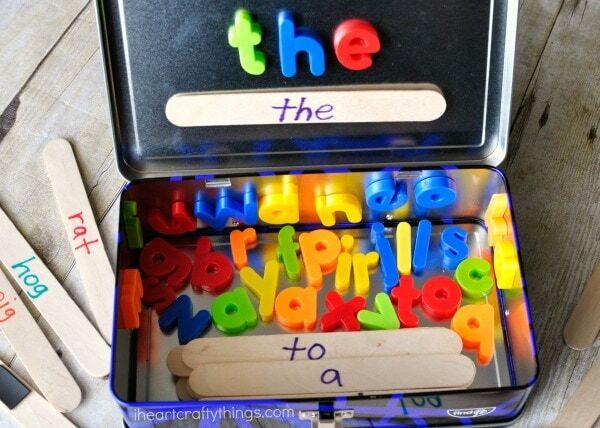 Place the finished words in the metal pencil box, along with a set of lowercase magnetic alphabet letters. 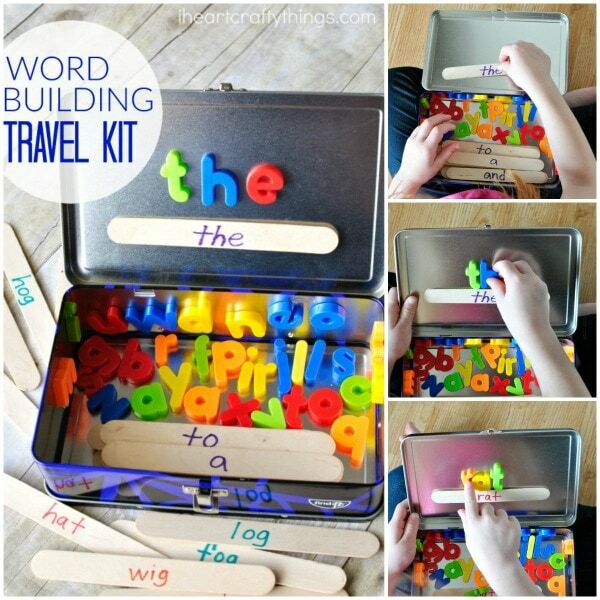 Now the Word Building Activity Travel Kit is all ready for play! 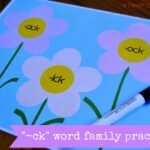 There are lots of different variations of this word building activity. The simplest way is to choose a word out of the pile that you want to build. Place the craft stick onto the top section of the metal pencil box. Then build the word by finding each of the corresponding magnetic letters and place them in order above the word. Spend some time saying each letter sound and blending them together to sound out the word if you are able. If not, simply name the letters and any corresponding alphabet sounds you do know! Continue working your way through the craft sticks, building all of the words. This travel kit can also be used with a pair of children as a Reading Guessing Game. One person holds the craft stick covering up the letters and reads the word aloud. The other person spells the word secretly inside the metal box. When they finish, each person reveals their word to see if they match! Another alternative word building activity is to have one person read the letters slowly, one at a time, off of a craft stick. The other person builds the word in the metal box, letter by letter. As soon as they think they know what word they are spelling, they can shout it out. The person with the word stick should show them if they guessed correctly. 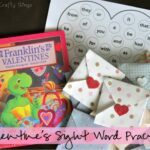 The great thing about this Word Building Activity Travel Kit is that it can be used in so many ways, with a variety of ages and stages, in pairs or independently! It’s a great way to get in some hands-on word work and it isn’t even limited to road trips! Try bringing it along to a doctor’s appointment or a restaurant to keep the children entertained and learning while you wait! A quick organization tip- if you make multiple sets of words, try keeping all of the different word types in different sandwich baggy. Label them clearly and then each time you pull out this travel kit, your child can choose a different bag to work with for a little variety! What fun activities do your children love during long road trips? 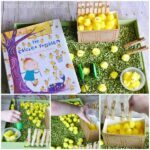 Looking for more fun summer crafts and activities to make with your children this year? 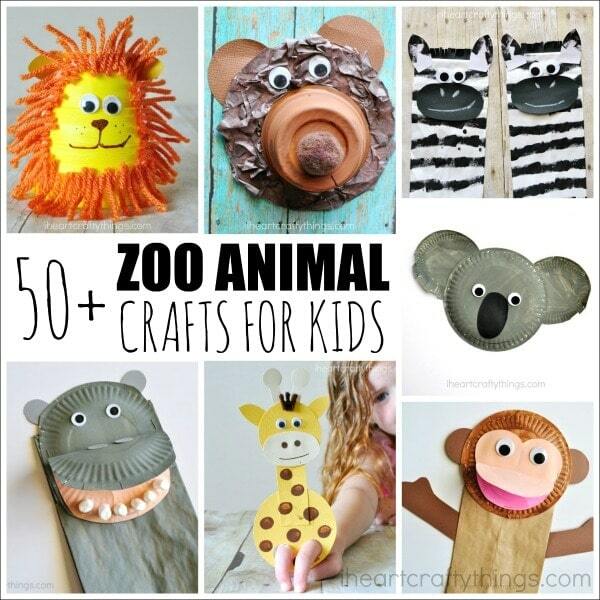 You might enjoy this list of over 50 zoo animal crafts for kids. I would like to buy this for my granddaughter. How do I go about it. Great idea! Thanks. I will make some for my granddaughter. This is perfect! 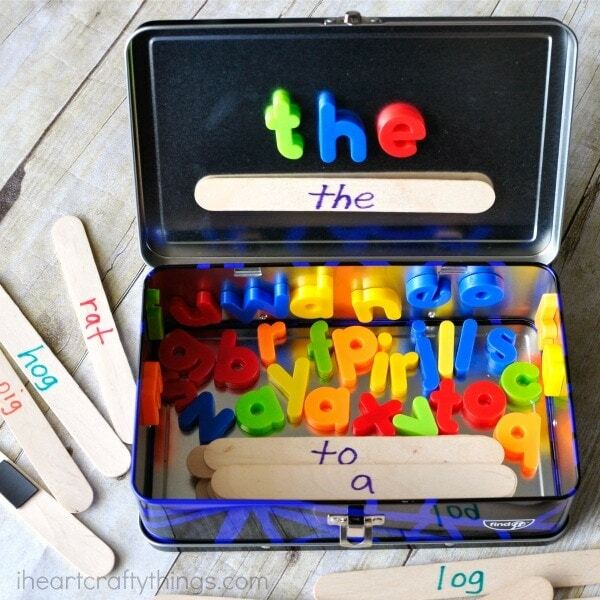 I have a small metal lunch box, magnetic letters, magnet strips, and popsicle sticks. I was trying to figure out how to use them together, now I know. This will be a great addition to my 1st grade Word Work Center this year. Thanks. P.S., I love crafty things too! What a brilliant idea! I love this:) It would be a great center for preschool, too. I have not been able to find lowercase magnetic letters. Can you please tell me where you purchased them? Thank you! I did something similar, I was in a time crunch and used dollar store round cake pans. I Purchased their alaphabet magnet letters (two sets) Due to the double letters needed. I also bought the dollar store flash cards- color/shape and first words. I buy all the magnets and set of cards inside the pan and took felt and Velcro on a strip. I used my E6000 glue to glue the Velcro on the pan half way and the other half I glued the Felt. Then when it was dry (24 hrs) the other half of the felt was able to be attached to the Velcro creating a “pocket” for their items. They use the flat part of the pan (back) to look at the cards and make the words. It was a perfect gift for two 3 year olds. Their game pieces fit inside the pan and it’s easy clean up for them and self storage. Great idea. Cost me under $10 for one. Pan $1, Velcro $1, Felt square $1, glue had- but they sell glue even crazy glue $1, 2 sets of letters $2, 2 sets of cards $2. Hi I’m Sabrina I will definitely do this with my grade one class thank you . I will definitely do this with my grade one class thank you . This is a great idea! I would say that beyond preschoolers, this is a perfect activity for pre-k, kindergarten, and 1st (I teach EC-4th grades). My twins are 5 years, 7 mo old and will be starting K this fall, and they are now learning this type of thing with me this summer. Thanks for sharing—will def use. Love this, made it, from here. Found all supplies at Walmart. Very useful as a teaching tool, game. Children loved it. This is a great idea! My child likes the LEGO magazines and asking how long until we get there. I think he’d like this. Yes! And keep this in your car for your kids to use instead of a cel phone on your daily commute to preschool! Add some magnetic shapes or puzzle with magnets on the back and it will become so much more interesting for all types of learners.